The Foundation of Every Charis home! Insulated concrete forms (ICFs) are hollow foam blocks which are stacked into the shape of the exterior walls of a building, reinforced with steel rebar, and then filled with concrete. Insulated concrete forms combine one of the finest insulating materials, Expanded Polystyrene (EPS), with one of the strongest structural building materials, steel reinforced concrete. The result is a wall system of unmatched comfort, energy efficiency, strength and noise reduction. ICFs can be used to build virtually any home plan, using any finish – brick, stucco, siding, and more. Insulating Concrete Forms… Easy. Affordable. Unbeatable. 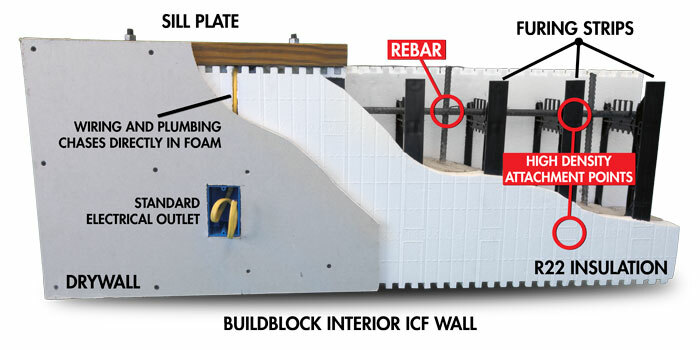 The model below shows you how the outside walls of your home look when you build with ICFs. The blocks are stacked to the height of your walls, reinforced with steel rebar, filled with concrete and then brick, stucco, rock, or siding it attached to the outside. On the inside your plumbing and electrical are run through the foam itself after the walls is poured. Drywall, plaster or stucco is attached to the inside, then finished with trim, flooring, and other finishes. In the end your home looks like any other, but performs 1,000% better. Learn how Insulated Concrete Forms are made. The foundation of every Charis home. Watch this demonstration to see the add strength building with Insulated Concrete Forms adds. If this Insulated Concrete Form house can withstand a car, wouldn't you feel safer building this way?